Ufology – that is the study of unidentified flying objects – is a fascinating subject. This fascination is increased in part by the rather ambiguous nature of the subject, which may be analysed as simultaneously containing a psychological aspect as well as a physical component. The boundaries of this subject are not clearly defined due to the perceived paranormal import of the phenomena that is being studied, this frees the subject to be more or less self-defining in an ever adapting and changing periphery that has to accommodate what is believed to be new information, whilst collating the evidence of past investigations. As all UFO research to date, regardless of its compelling nature, has not offered convincing empirical evidence that UFO’s are real physical entities appearing in a material world, the best research can only attain to the position of being ‘open ended’ in its conclusions regarding the nature of UFO phenomenon, providing the sighting has not been explained as a natural event. This is despite the fact that out of the many hundreds of UFO cases gathered from around the world, a certain percentage appears to be purely psychological in nature, whilst others seem to be describing an actual physical object. This is in conjunction with those cases that exhibit clear characteristics of both types. However, from a philosophical perspective this mechanistic approach involving an ‘either/or’ assessment of the evidence may not be the most effective method of investigation and analysis. The modern UFO phenomena is conventionally considered to stem from around 1947, but it is well known that since humanity has taken to the skies, unusual and unknown objects have appeared to have been encountered on numerous occasions. Modernistic logic, that is the thinking associated with the development of modernity through industrialisation, although useful, in many ways does not and can not adequately analyse phenomena that are existent beyond its scope of perception and identification. This is to say that although the encountering of UFO’s seems to have increased dramatically during modern times, it is also true to say that as Western Europe transitions into the condition of post-modernity, a new way of assessing information is both demanded and required. The dichotomy of a disembodied (subjective) mind observing an objective and separate material world is no longer relevant and does not encompass the ambiguity of the post-modern condition. There is an as of yet undefined third aspect to human knowledge that although is distinct from either the subject or the object – also encompasses an aspect of both of these entities. This allows for a far greater scope in interpreting reality, with this post-modern ambiguity having more in common with the strictures of quantum physics than with that of the old modernistic linear logic. Working from the perspective that ‘nothing is certain’, all statements of fact become highly contingent and permanently open to contestation. As soon as a fact is established (within the post-modern condition) it is immediately redundant and becomes the antithesis to the certainty it was intended to establish. Therefore a UFO sighting is far more than the appearance of an unfamiliar object within the physical environment. It is also indicative of many aspects of the human condition that converge within an ever shifting psycho-physical environment. Despite the rather obvious mystical nature of many of these sightings and their contributory factors, exactly what the sighting means is open to conjecture and debate. This is to say that objects in the sky are not a product of one particular viewpoint but appear throughout all cultures in the world. One such example of this transcultural phenomenon is the so-called Dropa Stones story found in Soviet (Russian) and Western European (primarily German and English) language sources since the 1960’s. A particular peculiarity of this story is that although it purports to convey the details of an interesting archaeological discovery unearthed in Western China prior to the 1949 Communist Revolution, the story as it is traditionally presented in the West contains no reference to Chinese language source texts. What is included are two names of Chinese scholars described as ‘professors’, but their names are only given in phonetical form (in the various western languages), with no reference to the actual Chinese ideograms used to spell them. An identical observation can be applied to the term ‘Dropa’ which like the transliteration of the two Chinese personal names can only be viewed as an ‘approximate’ and therefore insubstantial rendering from the Chinese language into Western languages. This lack of Chinese source materials is highly problematic when considered in the light of the actual claims contained within the story, and is perhaps indicative of the fact that archaeology does not happen in a moral or political vacuum, and is very much directed by the prevailing ideology of the time. Archaeological interpretation is the product of a number of considerations, many of which are not academically objective in nature, and that pursue various other agendas in the assessment of gathered information deemed worthy of consideration. Erich Von Daniken’s interview with Alexander Kassanzev is not the only example of Western paranormal investigators consulting Soviet academic experts regarding the study of unusual or rare phenomena. Generally speaking Soviet scientists fully embraced the concept of Socialist free-thinking and tended to be more open minded than many of their Western scientific counter-parts when it came to the consideration of phenomena that might be interpreted as paranormal in nature. In his 1980 television series entitled ‘Arthur C Clark’s Mysterious World’, Arthur C Clark consulted Soviet academics Leonid Korinov and Alexei Zolotov in his investigation of the huge explosion that occurred in 1908, and which flattened 830 square miles of forested land in the Tunguska area of Siberia, Russia. Dr Alexei Zolotov was willing to consider that the explosion could have been caused by an alien space-craft exploding five miles above the Earth. This demonstrates that the Soviet Union, although deemed the ideological enemy of the West was actually well disposed toward the consideration and investigation of the paranormal, and that it is not unreasonable to consider the Dropa Stones story a legitimate happening within pre-revolutionary China. In the post-modern, internet age, at a time that has seen a tremendous liberalisation of the Chinese Communist regime, Chinese language source texts are readily available for Western scrutiny. Whereas in the past there was no apparent Chinese import into this story, today Chinese language texts about the Dropa Stones are available for translation and study. What this shows is that the transliterations used in non-Chinese (Western) sources are out of date, misleading and in need of revision. This is important as the Dropa Stones story has evolved as it has moved from country to country and between one language into another. The criticism of the story by those who consider it untrue, suffers from similar interpretive ailments which see misinterpretations taken as fact and repeated continuously without any pause for thought or reliable reference. The basic story as conveyed through Erich Von Daniken’s book is conventionally plausible as a normal archaeological expedition – it only appears to become implausible as it develops into a narrative stating that a UFO crashed upon Earth, and that the bodies of aliens were discovered. It is this part of the story (and its associated, later developments) which attracts much criticism. Much of this criticism does not distinguish between the probable and the improbable, and makes no attempt to seek out any Chinese language sources. As this story is about an occurrence that happened in China, it is important that Chinese source texts are accessed to establish what is routinely conveyed to readers in that language. The Du-li-ba Ethnicity (English: Dropa, Drokpa or Dzopa) is a group that is believed to have arrived at the China-Tibetan border area around 12,000 years ago. They are described as a pygmy race and thought to be of extraterrestrial origination. However, as matters stand today there is no generally accepted evidence that this applies to the modern Du-li-ba (Dropa) people, or that their ancestors were extraterrestrials that crash-landed on this planet. In 1938 the Beijing University professor Qi Fu Tai (齐福泰) led a group of students on an expedition to explore a series of caves situated near the Bayan Kala Mountain Range. He discovered that the caves consisted of a system of hewn tunnels and had areas that seemed to be designed as storage rooms. The walls were very straight and smooth, and appeared to be polished. It was as if the mountain had been subject to a type of drilling that involved very high temperatures. There were no obvious inscriptions or texts to identify the remains in the graves, but there were hundreds of stone discs (described here as ‘石碟’ or ‘Shi Die’, literally a ‘stone plate’, but which is described later in this text as ‘碟片’, or ‘Die Pian’, literally ‘plate disc’) measuring approximately 30cm (30厘米) wide, that were later referred to as the ‘Dropa Stones’. Each disc had a 20cm (20厘米) hole in the middle and was engraved with two small grooves that spiralled inward from the edge of the disc toward the centre. When held in the hand the discs and their winding design appeared very elegant. All the discs discovered carried the same unusual spiralling pattern. The discs were transported back to Beijing University where over the next two decades the many attempts to interpret their function or meaning all failed. 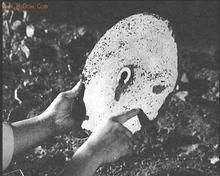 Then in 1958, Dr Tsum Um Nui of Beijing examined these stones in greater detail and discovered that the grooves in each disc contained very small and unusual hieroglyphs that could only be seen through a magnifying glass, despite the fact that some of the grooves had been damaged or had disintegrated over-time. When Dr Tsum tried to decipher these hieroglyphs, he discovered that the Du-li-ba (Dropa) people crash-landed on Earth when their spacecraft (‘太空船’, or ‘Tai Kong Chuan’, literally ‘Grand Space Ship’) malfunctioned. Furthermore, most of those who survived the crash were apparently killed by the local inhabitants. In 1965, Professor Qi Fu Tai, and four of his colleagues were finally permitted to publish their findings and to explain the reasoning behind their theory. The name of the publication was: ‘Around 12,000 Years Ago a Spacecraft Landed on the Earth as Described in the Engraved Text Found on the Stone Discs’. Russian scientists requested to see these discs and so a small number were made available and were sent to Moscow for investigation. In this place of mystery there lives the Han Chinese and the Du-li-ba (Drokpa) people. The word ‘Drokpa’ is of Tibetan origin and refers to a particular kind of people. It literally translates as ‘Herder of Animals’ (and is expressed in Chinese as牧者 – Mu Zhe). The term refers to a group of farmers known to live in Western Tibet and who make a living from herding animals. Today, the Dropka people and the Chinese (Han) people are now all considered ordinary people living in the Tibet region. In appearance these people appear to be of average height and build, and are not considered undersized. There are no outstanding physiological abnormalities, and these people do not live in caves. These photographs appear in the Chinese language article to illustrate the story. What constitutes a major difference between this (Chinese) text and that of the Von Daniken (Kassanzev) version is that this text does not make any mention of the walls of the cave containing markings or drawings. 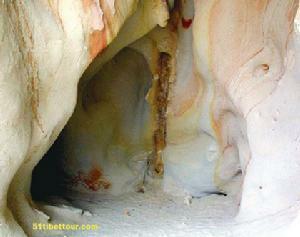 Indeed, what the Chinese text adds is that the walls of the cave system appeared to have been subjected to high temperature drilling implying that the hard mountain stone had been melted to form the passages – a hypothesis apparently supported by a photograph that purports to show a cave entrance that looks as if the rock had cooled forming what looks like ‘bubbles’ in the stone. Professor Qi Fu Tai publishes his work in 1940 in the Von Daniken version, but in the Chinese text the same event is reported as occurring in 1965. Although Tsum Um Nui is mentioned in the Chinese text, no mention of the publication of his work (which according to Von Daniken happened in 1963) is made at any time, although both texts agree that Tsum Um Nui is the academic who makes the break-through in the deciphering of the disc hieroglyphs. As there are no Chinese characters representing the name ‘Tsum Um Nui’ in the Chinese text, it is difficult to ascribe with any degree of certainty exactly who this person was. Generally speaking even foreign names are usually rendered into Chinese characters, particularly foreign people living and working in China. A review of a number of other Chinese language texts discussing the Dropa Stones story, show that none use Chinese characters for Tsum Um Nui’s name, and that it appears to be a convention to spell his name only in transliteration. This is problematic as this is not typical of Chinese texts particularly in relation to other Asian names that although might not be Chinese, certainly appear to be related, such as those from Japanese or Korean. Obviously the Von Daniken text is quoting from Russian sources where the transliteration of key Chinese terms, names, and geographical locations has been rendered into the Russian script. Erich Von Daniken is translating these terms into his native German, which is then rendered into other languages such as English. In this respect and with regard to Professor Chi Pu Tei’s name it is clear that despite the many different translations from the Russian – which presumably was originally produced at some point in time directly from a Chinese language source text – the transliteration of this name has been remarkably well preserved from the original Professor Qi Fu Tai (齐福泰). Why does Tsum Um Nui’s name not possess Chinese characters in either the Chinese or Von Daniken versions of the Dropa Stones? One possible explanation might be that the name itself could be a foreign transliteration of a Chinese name that originates within an ethic or regional Chinese minority group, such as Fujian, She, Teochiu, Danka, or even Hakka, etc, and that does not sound in pronunciation like Chinese names pronounced in the official language of Manderin (普通話 – Pu Tong Hua). This would seem to imply that the name of Tsum Um Nui was passed on verbally and not in a written form as in the case of Professor Qi Fu Tai (齐福泰), and may be representative of a later layer of information contained within the Russian text conveyed to Von Daniken, added after the original Chinese text was translated. Later, with the liberalisation of China, researchers in that country probably encountered the Von Daniken text and cross-referenced it with the extant Chinese texts in their possession and added the information about Tsum Um Nui, but as this name does not represent a Manderin transliteration Chinese scholars were not able to render it into Chinese characters, therefore the name of Tsum Um Nui remains ‘Tsum Um Nui’ in Chinese texts – although he is given the Chinese title of ‘Bo Shi’ (博士) which equates to doctor of philosophy. However, it is reasonable to assume that there must have been some other corroborating evidence for Tsum Um Nui’s involvement in the Dropa Stones story in China that has allowed his name to be placed into a Chinese text without being expressed in Chinese characters – evidence that is not obviously contained in contemporary Chinese or non-Chinese texts dealing with this subject today. Whatever the truth of the matter, both texts agree exactly upon Tsum Um Nui’s role and state clearly and unambiguously that it was he who deciphered the hieroglyphs engraved within the spiral groves found upon the discs. Indeed, within the Chinese text it further states that it was Tsum Um Nui who not only deciphered the hieroglyphs, but also originally discovered that such hieroglyphs existed within the grooves themselves that could only be seen through a magnifying glass. The Von Daniken text implies that these hieroglyphs were evident to Professor Qi Fu Tai and his expedition staff in 1938 prior to the discs being transported to BeijingUniversity. The Von Daniken text refers to Professor Qi Fu Tai as being an archaeologist but gives no details as to the academic establishment he worked for. Furthermore in the same text Tsum Um Nui is described as working for the ‘Academy of Pre-Historic Research’ in Beijing. In the translated Chinese text it clearly states that Professor Qi Fu Tai worked for Beijing University (北京大学 – Beijing Da Xue), but that Tsum Um Nui studied the Dropa Stones whilst resident in Beijing – it does not associate him obviously with Beijing University or the so-called ‘Academy of Pre-Historic Research’. Certainly the ‘Academy of Pre-Historic Research’ is not included in the Chinese text, although it may be assumed that Tsum Um Nui examined the Dropa Stones in Beijing University because this is the place where they are known to have been stored for around 20 years after the time of their discovery in 1938. The exact number of the discs are said to have been 716 in number in the Von Daniken text, but the Chinese texts speaks only of ‘hundreds’. In the Von Daniken text Professor Qi Fu Tai is said to have believed that the unusual skeletal remains with the large skulls were some kind of extinct ape – but the Chinese text offers the exact opposite explanation saying that Professor Qi Fu Tai actually criticised those in his expedition who believed this to be true. Both texts continuously disagree upon the role Professor Qi Fu Tai plays in this story, but it is the Chinese text that states Professor Qi Fu Tai’s name in Chinese script – 齐福泰 – and which gives an exact title for his published paper upon the subject – ‘Around 12,000 Years Ago a Spacecraft Landed on the Earth as Described in the Engraved Text Found on the Stone Discs’ (关于在12000年前降落在地球的太空船的蚀刻文字，就如同碟片上说明的一般), also given in Chinese characters. The Chinese text presents Professor Qi Fu Tai as fully supporting the findings of engraved stone discs and unusual skeletons but having no conventional explanation for them at the time, despite implying that he thought some thing highly unusual had occurred in the Mountains of Bayan Kala – even before the story stating that extraterrestrials landed upon the Earth 12,000 years ago was revealed by his colleague Tsum Um Nui. It is only after this revelation that Professor Qi Fu Tai (working with four other colleagues) decides to pull all the information together and publish his paper in 1965. By way of contrast, the Von Daniken text portrays Professor Qi Fu Tai as some thing of a sceptic who desperately tries to maintain the decorum of mainstream academia whilst dealing with this subject. Except for both texts agreeing on the date of 1938 for the initial discovery, no other dates agree. Professor Qi Fu Tai – in the Von Daniken text – is said to have published his paper in 1940 within which he claim that the unusual skeletons found in the cave were an extinct form of ape that probably was the evolutionary ancestor of the local inhabitants of the area, the modern day Dropa and Kham. Apparently this paper attracted criticism from the academic community as many were not willing to accept the idea of a highly localised evolutionary event. After the year 1940, Professor Qi Fu Tai disappears from the Von Daniken text, and all the innovations and subsequent published paper regarding the discs and their content are provided by Tsum Um Nui. According to this version it is Tsum Um Nui who publishes his findings about extraterrestrials (working with three colleagues) in 1963. Alexander Kassanzev informs Erich Von Daniken that it is this 1963 paper of Tsum Um Nui that was extracted in the 1968 Soviet magazine Sputnik. Both articles agree that a number of these stone discs were delivered to the Soviet Union for study, but only the Von Daniken text suggests that this study revealed unusual qualities – such as the finding that the stones may have been subjected to very high voltage electricity at some point in their history. In reality the details of the translated Chinese text and that of the Von Daniken text suggest that both papers are reporting the same incident from a similar set of recorded details, as both texts end their respective narratives in the 1960’s. Although of an obvious similarity the differences between the texts are both subtle and compelling. The Chinese text, for instance, clearly states that there is no evidence to support the details of the story it reports, whereas the Von Daniken text is delivered with certainty and presented in a manner that suggests that the conveyed story is true – that aliens crash-landed on Earth 12,000 years ago – and that no other logical explanation can be considered correct. To be fair to Erich Von Daniken, he clearly states that he keeps an open mind on the matter regarding the story he has just heard from Alexander Kassanzev. There is the possibility that the Chinese text is merely a Chinese translation of the Von Daniken text, but certain inherent inconsistencies contained within the text question this hypothesis. Obviously it is true that neither text gives Chinese characters for the name ‘Tsum Um Nui’, but the Chinese text does give Chinese characters for both Professor Qi Fu Tai’s name (齐福泰), and the academic rank of ‘Bo Shi’ (博士) of Tsum Um Nui. In the Von Daniken text Tsum Um Nui is always referred to as a ‘professor’, whereas in the Chinese text he is clearly designated a ‘Bo Shi’, or ‘academic doctor’. The two texts agree that the expedition occurred in 1938, but when all the other key dates contained within the two texts are compared there is a wide variation in presentation. The Von Daniken text says that Professor Qi Fu Tai published a more or less standard academic paper in 1940 assessing the skeletal finds in an evolutionary manner, but this is not mentioned at all in the Chinese text. In the Von Daniken text it is Tsum Um Nui who publishes his paper about crashed aliens in 1963, whereas the Chinese text states that it was Professor Qi Fu Tai who published the paper in 1965 – and gives the title of the paper itself. The published paper is not named in the Von Daniken text. The Chinese text does not give an exact number to the amount of discs that are found – referring to the number as being in the hundreds, but the Von Daniken texts states that there were 716 discs recovered and brought back to Beijing University. Interestingly, the Von Daniken text reports cave drawings that looked like space-craft and planets joined together by dots – obviously a vision that implies space travel – but the Chinese text omits this aspect of the story completely. If the Chinese text was merely a translation of the Von Daniken text, it is difficult to explain the wide variance in the details as they are presented. This above Chinese text was chosen for translation from the many others that exist as it presents the Dropa Stone story in a similar but different manner to the Von Daniken text. The time period 1938 to 1965 may be considered the key foundational era of the story, with every thing that is ascribed as discovered beyond 1965 defined as an elaboration or later development. However, the story as it exists in both the West and China today does incorporate details beyond the initial story presented by Erich Von Daniken, and it is this extension of the Dropa Stone Story that must now be examined, as these details constitute an important contemporary layer of development. If the first inklings of the Dropa Stones story appeared in 1960 in the Soviet Union, then this version of the story could not have included details of a published paper from either Dr Tsum Um Nui or Professor Qi Fu Tai, dating from 1963 or 1965. More emphasis must have been placed upon the original 1938 expedition and the years before 1960. The Chinese text translated above states that Tsum Um Nui deciphered the disc hieroglyphs in 1958, whereas the Von Daniken text has the date as being 1962. Obviously the publishing of an academic paper and the idea that the discs were examined by Soviet scientists demonstrates a layer beyond that of the original story. Of course this does not necessarily mean that these events did not actually occur – obviously before Von Daniken was told of this story, these developments could well have already been integrated into the story by 1968. The next important step after the Von Daniken narrative is that of the appearance of the Austrian engineer named Ernst Wegener. Ernst Wegener, in the narrative associated with his story, describes these stones as measuring 12 to 12.5 inches in circumference, and possessing a thickness of about 2.2 inches. Each disc weighed around 2.2 pounds in weight, and there was a spiralling groove that ran from the centre to the edge, and back to the centre again. Ernst Wegener does not report that he saw hieroglyphic characters within the grooves, but does mention that these two stone discs were not in the best of condition. When he enquired about the origin of these two stone discs, the museum director stated that they were ‘cult discs’ and that nothing more was known about them. It is obvious from the general narrative involving Ernst Wegener that these exhibits were not labelled ‘Dropa Stones’ in the Chinese language, and that he must have been aware of the Dropa Stones story prior to his discovery of these objects in Xian. Having read the description of the stones from other sources, he saw these objects and concluded that they were ‘Dropa Stones’. As these objects possess the characteristics of the Dropa Stones as described in both the Von Daniken and Chinese texts referenced above, it is not an unreasonable association for Ernst Wegener to make. However, the Ban Po Museum was built in 1958 specifically to house the very important archaeological finds in the local area that relate to a Neolithic settlement dating to around 4700BCE. There is no reason for this museum in northwest China, which is hundreds of miles from either Beijing University, or the Bayan Kala Mountain Range, to house artefacts discovered in the remote Chinese-Tibetan border area, that were then transported to Beijing University for study. Furthermore, the Ban Po Museum has only existed since 1958, twenty years after the original expedition of 1938. Coincidently, the year 1958 is the same year that the Chinese text referenced above states that Tsum Um Nui managed to decipher the hieroglyphs contained within the stone grooves of each disc. By 1958 the stone discs had been in storage at Beijing University for twenty years. At the Ban Po Museum in Xian, stone discs discovered in the Bayan Kala area would be out of archaeological place – and would not fit-in with the Ban Po Neolithic finds and would have no purpose being on deliberate display. Ernst Wegener, however, clearly photographed stone discs that he believed to be the Dropa Stones. All descriptions mention the hole in the middle and the spiralling grooves, with the Von Daniken text adding that the discs were 2cm in thickness, and resembling ‘long-playing records’. The Chinese text describes the stones as being 30cm in diameter, agreeing with the approximation contained within the Von Daniken text, but then states that the hole in the middle of each disc actually measures 20cm in diameter. The Chinese text is the only source of reference that gives a size for the hole contained within the middle of each disc. This description suggests a rather large central holed segment contained within a relatively small stone curvature and is at variance with the photograph contained within the translated Chinese article and virtually all other depictions of the Dropa Stones. Ernst Wegener’s description is even more problematic as he refers to the discs being 12 to 12.5 inches in ‘circumference’ and not diameter. Furthermore, the Von Daniken text states the discs to be 2cm in thickness, whereas Wegener describes them as being about 2/5th of an inch thick, or just over 1cm. If Wegener’s description of a 12 inch circumference is correct, then this would mean that the stones he is describing would have a diameter of 3.82 inches or (9.55cm). This would mean that Wegener’s description (and photographs) of the stone discs suggest a diameter similar to that of a large drinking mug or pint glass. 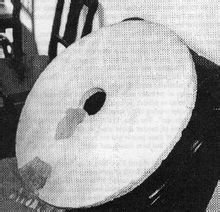 In this respect Wegener’s description differs widely from that presented in both the Von Daniken and the above Chinese text, both of which agree that the stone discs possess a diameter of 30cm, making a circumference of 94.2cm – exactly equal to that of a long-playing vinyl record. The Chinese text, however, describes the central holed area as being 20cm (around 8 inches) across, whilst Von Daniken simply says that the stone discs had a hole in the centre. Wegener’s account says nothing of a hole in the centre, but the presence of a holed centre is obvious from his Polaroid photographs. Wegener also mentions that he was permitted to handle the stone discs and that each weighed around 2.2 pounds – neither the Von Daniken nor the Chinese text mention the weight of the discs. Wegener believes that the stone discs he examined were made of either granite or marble, in agreement with Von Daniken’s assertion that they were made of granite. The Chinese text simply refers to the discs as being made of ‘stone’ (石 – Shi), a term that carries the meaning of ‘rock’, but says nothing about the particular type of rock (or stone) that is being discussed. Wegener’s description agrees that the discs are circular, holed in the centre, and contains spiralling grooves etched into the stone, but his description of the dimensions of the discs themselves is at variance with that contained in both the Von Daniken and the Chinese text – Wegener’s discs are far smaller in structure, and yet it is only Ernst Wegener who has provided some kind of documentary proof of the existence of the Dropa Stones. In the Chinese language this type of artefact is referred to by the single character ‘Bi’ (璧). This translates as a round, flat piece of jade with a hole in the middle, but is also a term that has been extended in use to refer to any jade artefact in general such as jade-wares and ornaments. In many ways, the Dropa Stones story appears to take a familiar ancient and spiritualised object of a jade disc, and imbues it with an extended cosmology that involves visitors from another planet that bring their advanced technology to Earth, and subsequently recording this event upon a library of stone discs similar to the long-playing vinyl records commonly found in the 20th century. Of course, the Dropa Stone discs in question are not made of jade and are never referred to as ‘Bi’ (璧) discs in any of the extant literature – this is one point that all versions of the story agree upon – as the Dropa Stones are said to be made of some other sort of stone (usually granite or marble). Despite the structure and design of the Dropa Stones appearing to mimic jade ‘Bi’ discs, the Chinese text is very careful never to refer to them as such, and the conclusion may be drawn from this that whatever the Dropa Stones are, they are not jade ‘Bi’ discs. It is an interesting question as to why aliens living upon planet Earth 12,000 years ago would choose a communicating medium that is very similar to a long-playing vinyl record not known in the history of humanity until the 20th century. The problem of the Dropa Stones is compounded by a lack of foundational evidence that can be examined objectively and at first-hand. The story is known primarily through secondary sources that can be examined for clues but not verified through actual evidence. To date Western sources have all but ignored the possibility of examining Chinese texts to verify the story. These Chinese language texts do exist and offer interesting and enticing variations from the established Western narratives – suggesting the possibility that the contemporary Chinese texts are continuing the tradition of maintaining commentaries extracted from older texts that are no longer extant. Considering the violence associated with Chinese history during the 20th century it is not unreasonable to consider that the original academic papers may have been destroyed, and that certain key-points of the facts have been preserved in reality through brief written descriptions assembled from memory. There is also the possibility that the original academic papers in China still exist and are being kept secret for various governmental reasons. Whatever the facts of the matter, when the German paranormal researcher Hartwig Hausdorf arrived in China for the second time in 1994, he and an American journalist named Peter Krassa visited the Ban Po Museum in Xian – made famous by Ernst Wegener – and questioned the then director Professor Wang Zhijun about the stones. According to Hausdorf, Professor Wang was reluctant to speak on the matter, but stated that both the stones (photographed by Wegener), and the director he spoke to, had both disappeared shortly after his visited in 1974. 1) The 1938 expedition occurred. 2) Professor Qi Fu Tai existed. 3) The unusual skeletal remains. 4) The existence of the stone discs. 5) That Dr Tsum Um Nui existed. 6) That the hieroglyphs existed on the stones. 7) That the hieroglyphs spoke of an alien crash. 8) That the Soviet Sputnik magazine published the story in the 1960’s. 9) That the Soviets examined the stones. 10) That either Qi Fu Tai or Tsum Um Nui published a paper. 11) That Ernst Wegener existed and that he visited China in 1974. 12) That Ernst Wegener’s photographs are genuine. The Chinese text translated above states clearly that there is no evidence for the proof of the story as it stands, even though the story itself appears to be compiled from a more complete account that is no longer available. Its disparate nature would imply that it is not the creation of a single person at a specific time, but rather a story that has slowly built-up momentum over the years, gathering details from various sources. It is also interesting to consider that this story about China broke in the Soviet Union at the beginning of the Sino-Soviet split (1960-1989), at a time that witnessed the development of an intense ideological aggression and difference of opinion between the two countries. Where did the Soviets first get this story? Presumably from an unknown Chinese source. Why would a Chinese source reveal this story at a time of great divide between the two countries? It is doubtful whether China would have provided what amounts to national treasures to the Soviet Union for study in the 1960’s. If stones were provided to the Soviets, where are these stones now and why is there no Soviet photographs of the Dropa Stone discs that they allegedly investigated? Despite all this uncertainty, however, there is one shred of evidence supplied in the Chinese text that suggests that the story itself might have some basis in fact. Apart from the interesting discrepancies between the Chinese text and the Western versions of the story, the fact that Professor Qi Fu Tai (齐福泰) has a name written in Chinese characters is very important. The surname in Chinese culture is treated with the utmost seriousness as it is intimately related to the Confucian notion of respect for the ancestors and correct behaviour in society. It is unlikely that a surname would be ascribed to a fictional character as this would cause offense and amount to an insult to those holding the surname itself, as the fictional character would be endowed with all the clan rights and privileges associated with that name – rights and privileges that can only be earned through birth right, adoption, or in the case of women, through marriage. The surname ‘齐’ (Qi) is the simplified modern expression of the traditional Chinese character which is written as ‘齊’. It symbolises a field of grain that is straight and orderly, and implies a person who is inwardly well ordered and who is able to influence the outer environment in the same manner. This surname is associated with the ancient Qi State and is considered to be 2500 years old – the surname is believed to have originated in the Ru Nan County of Henan province. The forenames are ‘Fu Tai’ (福泰), with Fu (福) meaning ‘happiness’ and ‘good fortune’, whilst Tai (泰) means ‘good health’ and ‘peace’. If an unknown Chinese author fabricated the Chinese text version of this story, perhaps by translating the Von Daniken text into Chinese and then adding Chinese characters for Professor Qi Fu Tai, then the question has to be asked why the name of Dr Tsum Um Nui was not treated in the same way, even if the name itself is of Japanese or Korean origin? Rendering the name of Tsum Um Nui into a Chinese, Korean or Japanese format would presumably have added weight to the authenticity of the Chinese text, and although Qi Fu Tai is clearly a Chinese name, the name of Tsum Um Nui is left in Western transliteration. It would have been a relatively easy matter to declare Tsum Um Nui to be a regional pronunciation of a Chinese name, and then present Chinese characters with a different pronunciation in Manderin Chinese. This evidence would suggest that at the heart of the matter of the Dropa Stones story there is a core of fact, but exactly what this ‘core’ represents, is open to debate in the light of the current lack of corroborating evidence. The 1938 expedition to the remote China-Tibetan border is not an unreasonable undertaking considering that much of China at the time was engaged in warfare and unsuitable for such academic undertakings. At this time Western China would have been far removed from the military activities common elsewhere. The Dropa Stones are not jade ‘Bi’ discs, but despite not being constructed from jade they are described as being similar in design to them. The discovering of ancient skeletal remains is not uncommon in world archaeology, and China is no exception to this fact. These three facts; the 1938 expedition, the stone discs, and the skeletal remains, serve as the basis for the Dropa Stones story. This core assemblage of facts is not necessarily far-fetched and it is not unreasonable to assume that they are true. This assumption is not based upon the viewing of objective evidence, but rather is due to the consideration of the balance of probability. What exactly these facts indicate or mean is open to further investigation and debate. The entire truth about the Dropa Stones may only be revealed if and when the original Chinese source texts become available in the public domain. Lawrence, Richard: UFO’s and the Extraterrestrial Message – A Spiritual Insight into UFO’s and Cosmic Transmission; CICO Books (2010). This book covers many of the well known UFO sightings and encounters in the world and is typical of a well written example of the spiritualised genre associated with alien contact. See: Bernbeck R & McGuire RH; Ideologies in Archaeology – University of Arizona Press – 2011, for a very interesting investigation into the academic subject of Archaeology and the competing ideologies that seek to control the abstract notion of ‘truth’ in the historical assessment of evidence from the past. Once an interpretive paradigm is established, the mainstream academic community will pursue its strictures regardless of any evidence to the contrary. Daniken, Erich Von: Return To The Gods – God From Outer Space; Corgi (1970) Pages 109-122. The Copyright is dated to 1968, which is presumably the year of the original German addition. Interestingly, the 1970 English translation, although containing many and varied photographs, does not include any illustration of the Dropa Stones. Hausdorf, Hartwig: The Chinese Roswell; New Paradigm Books (1998) – Page 196. Ritsch V & Tschernenko M – Were Aliens Visitors To Earth? – Russian Digest (May) 1960. Hausdorf, Hartwig: The Chinese Roswell; New Paradigm Books (1998) – Pages 28-30 for an explanation of the early spread of the Dropa Story in print from the Soviet Union into Western Europe. Oddly Hausdorf states that the Vegetarian Universe published the Dropa Stones story AFTER the 1968 Sputnik article – but the Vegetarian Universe article entitled ‘UFO’s In The Past?’ is referenced on page 196 of his book as appearing in July, 1962. < http://www.badarchaeology.com/?page_id=360> Accessed 21.9.12 for the (non-referenced) alternative date of 1967 for the edition of the Sputnik magazine in question. Coppens, Philip: The Ancient Alien Question; (New Page Books) – 2012. This book expertly covers the subject of the ancient astronaut hypothesis and includes a fully up to date and complete rendering of the Dropa Stones story (pages 207-219). The work is augmented by a Foreword written by Erich Von Daniken. The X Factor (Cover-ups, Paranormal, Mysteries, UFOs) Magazine: Published By Marshall Cavendish (1997) Issue 19; Blast From the Past – Pages 510-514 – for a thorough presentation of the facts surrounding the 1908 Tunguska explosion. Clark, Arthur C: Mysterious World – An Investigation into the World of the Paranormal; DVD Release (Network) 2008 – Disc Two Episode One – The Great Siberian Explosion. Originally released by ITV Productions LTD in 1980. < http://www.badarchaeology.com/?page_id=360> Accessed 21.9.12 for a typical criticism of this story. At no time do the authors attempt to reference Chinese texts, but do offer a deconstruction of this story as it has appeared in Russian, German and English sources. However, this blog article does not offer reliable, general academic references to support its declared premise. < http://dict.youdao.com/wiki/%E6%9D%9C%E7%AB%8B%E5%B7%B4%E6%97%8F/#> Accessed 16.9.12. This page is hosted by the Chinese online encyclopaedia Hudong (互动在线). Or ‘关于在12000年前降落在地球的太空船的蚀刻文字，就如同碟片上说明的一般’ (In Pinyin This Reads – Guān Yú Zài 12000 Nián Qián Jiàngluò Zài Dìqiú De Tàikōng Chuán De Shíkè Wénzì, Jiù Rútóng Dié Piàn Shàng Shuōmíng De Yībān). The academic rank of Qi Fu Tai is ‘Jiao Shou’ (教授) which literally translates as to ‘give instruction’ and equates to the position of professor. Bo Shi (博士) translates literally as ‘broad knowledge scholar’. 西安半坡博物馆 (Xi’an Ban Po Bo Wu Guan), or ‘Banpo Museum of Xian’. Hausdorf, Hartwig: The Chinese Roswell; New Paradigm Books (1998) – Pages 39-40, for an explanation of the Ernst Wegener story. See: < http://bpmuseum.com/> Accessed 22.9.12 for the official Chinese language site of the Ban Po Museum – and < http://www.chinamuseums.com/ban_po.htm> Accessed 22.9.12 for a site about the Ban Po Museum in English. The long-playing vinyl record in question measures 12 inches across, or approximately 30cm wide. Although the Erich Von Daniken text does not specifically state a measurement of width, it is this assumed width that has been used as the de facto measurement of the Dropa Stone discs in virtually all versions of the story, including that found in Chinese language texts. Circumference = Diameter X π (3.14) or Diameter = Circumference / π (3.14). See: Eichhorn, Werner; Chinese Civilisation, Faber and Faber (1969) – Page 28 for an explanation of how the Xia Dynasty (夏朝-Xia Chao – 2205-1766BCE) depicted the sun and the moon, together with divine entities and nature-spirits, in building social structures and agricultural interpretations. The flat jade disc with a hollow centre is believed to be a solar symbol and is still worn around the neck as a form of jewelry by Chinese women today, although Eichhorn advises caution as to their earliest meaning. Hausdorf, Hartwig: The Chinese Roswell; New Paradigm Books (1998) – Pages 40. Chung, Yoon-Ngan: The Origins of Chinese Surnames; Rio Bay Publishing (2001) – Pages 160-161 for an extensive explanation of the surname Qi (齊).